I'm so sorry if I'm totally driving you crazy with our Better Homes & Gardens article but I've been meaning to share the article on here for readers who weren't able to get a copy. (And, it really was the hi-light of our year; I'm not gonna lie.) If you click on the pics (photos by Helen Norman), you should be able to see them larger. 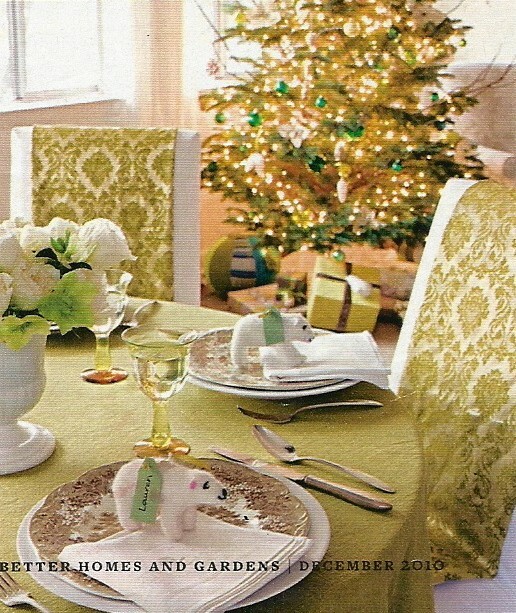 She used my silverware & china over my Pottery Barn plates and little polar bear Christmas ornaments for name tags. - my handwriting on them- yay! ha The vintage fabric draped over the parsons chairs really added something. I found it at Goodwill years ago as a set of curtains and it's gotten a lot of use. I even made a blanket out of some of it for Justin's room. 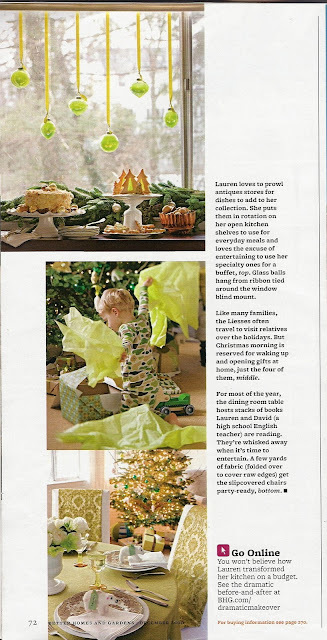 Thank you so much again to the team at Better Homes & Gardens: editor & writer Joanna Linberg, stylist/producer Jessica Thomas, and photographer Helen Norman & her assistant F.J. Hughes. and all of the in-house people like Shelley Caldwell who put the story together and to field scout Bonnie Broten... You guys are truly the BEST. Thank you, thank you. *The caged lantern in our entryway is by Minka Lavery... I have gotten tons of phonecalls & emails about it and I think may have been discontinued. The wallpaper in our breakfast nook is also discontinued. Our front door is "maple leaf" by Behr and our kitchen cabinets are "witch hazel" by Behr. I used the book Leonardo's Notebooks for the sketches in the entry. 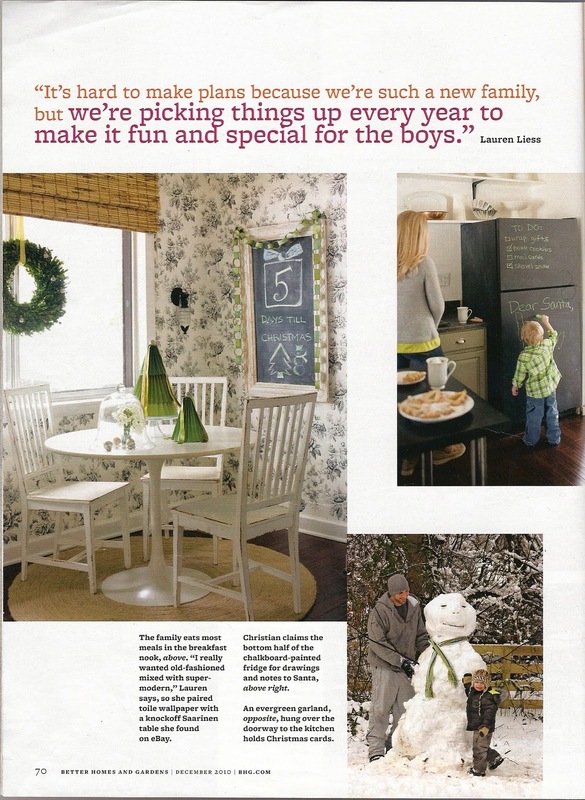 Loved seeing your home in the magazine. All the details are so perfect. I don't blame you for this being the hi-light of your year - thanks for sharing! 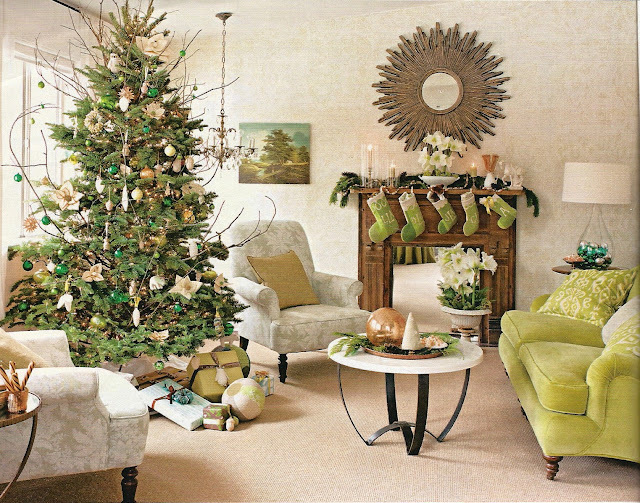 I was delighted to see your home in the magazine and on your blog. You know I am huge fan of your work. 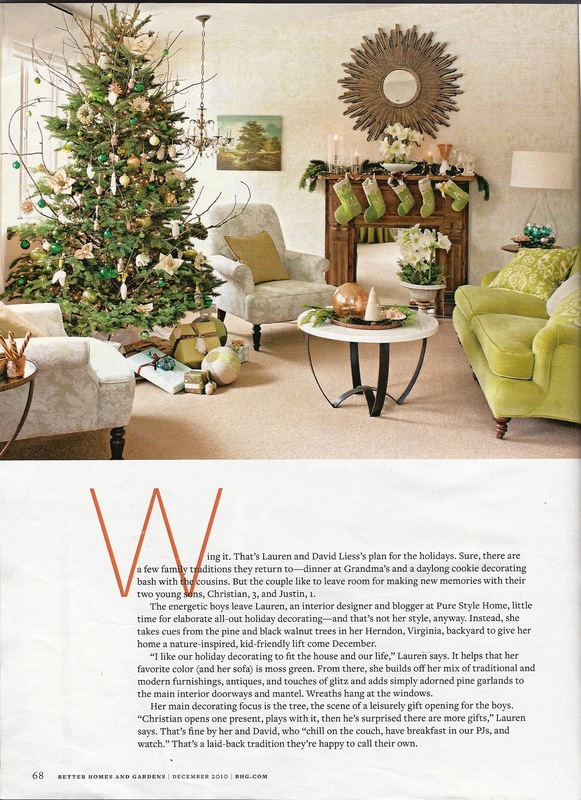 My mom was looking at my magazine copy over Christmas and as she came to your house feature, I said, "I know her. She's really nice." It was really fun hearing the inside scoop on your photo shoot. I always wondered if they brought in things to supplement what the home owner already has. 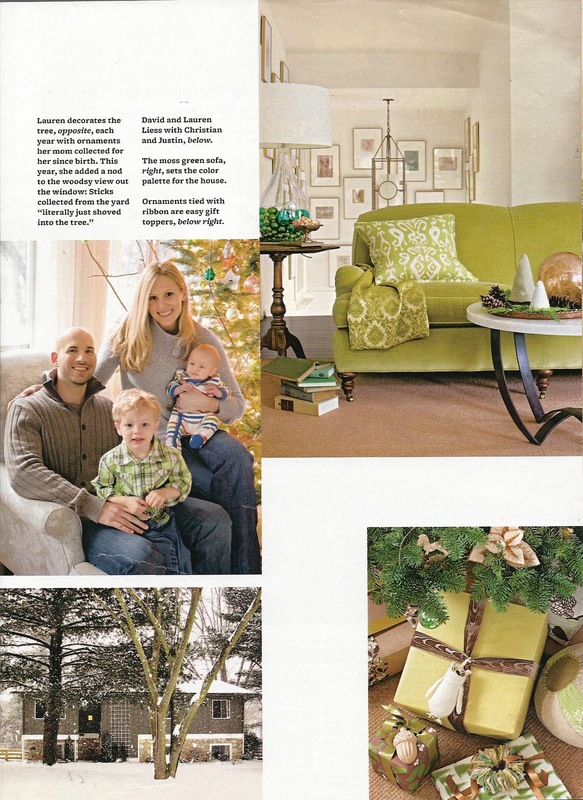 Loved seeing your home in the magazine. Thanks for sharing your 'behind the scenes' of the shoot. I love your perspective! CONGRATULATIONS Lauren! I am so happy for you!! It is the crown on your hard working days!! I wish you and your beautiful family a wonderful, Happy and Healthy 2011! I love reading your comments on the pictures! I did buy the issue and the garland around the kitchen door was definitely my favorite. I didn't get a chance to copy it this year, but next year I definitely will! Congratulations again, loved seeing the pics on line and the magazine! It is SO fun to see how it is in a magazine vs. on your blog (aka real life). Both are absolutely lovely, and it's so fun to see all the details! I'm so glad you shared this because I missed getting a copy. Everything looks wonderful ! I, for one, am not tired of it. I was so excited to get my BHG and told my husband "I know her I know her." Ha! I enjoy the pics comparing what they did with what you do. Don't spend that much on a squirrel nutcracker. My daughter collects nutcrackers but was always disappointed she couldn't really crack a nut with them so I found one on ebay last year (pic on my blog post "Nutcracker Mmantle" for much less. Am guessing they still are, esp. now that the holidays are over. Merry Christmas and congrats on all your "presents." Congratulations on such a beautiful magazine spread, Lauren. I'm glad you posted it as I have not had a chance to see it yet! Hoping you had a Merry Christmas and all the best in the New Year! Lauren, I for one adore the article and the amazing array of images from your delightful home!! Congrats!! Happiest of Holidays & All the Best in the New Year! I love your vintage fabric on the chairs...giving me lots of good ideas! It was a beautiful article! I hope you enjoy your holiday with the boys and get a well-deserved break. Thanks for revisiting the article and giving us more of the behind the scenes tidbits......... I love my copy of that issue and definitely will add it to my "save" pile for magazines I refer to again and again for inspiration. You are right to protect these days for family time and allow yourself to get recharged for all of the excitement that I am sure awaits you in the new year. Wow! What a beautiful spread! You must be so excited and proud! So glad you featured the spread - I hadn't picked up a copy yet! Such a beautiful feature! Congrats! Your NOT driving me crazy at all If it was me I would do the very same thing....You should be proud and I'm sure you are, I love looking at your home over and over again It's BEAUTIFUL, I wish my home could be in a magazine.. You go girl talk about it as much as you want. I loved looking at your gorgeous home in the magazine! I've been reading BH&G for years. Did they approach you for the shoot? All the best to you in the upcoming NEW year! Well deserved...I am such a fan of your blog - not always commenting but always following - I was thrilled when I received my issue and your fabulous home was included - you must be over the moon!! Lauren, I've been meaning to write this to you and this post is the perfect excuse to do so. I ran out and grabbed the Dec. copy of BHG just because I have been waiting all year to see your story. I know, dorky, but I was excited that another designer that I follow had something so exciting happen to them! The pictures and story are wonderful and I've been showing all my friends. I'm just really happy for you and wanted to say congrats and keep up the good work! I hope you had a wonderful Christmas. 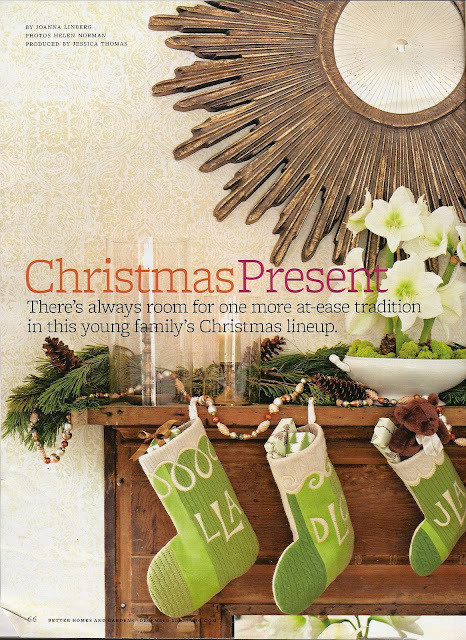 Hubby always puts decorating magazines and chocolate in my stocking, which I love and look forward to every year. 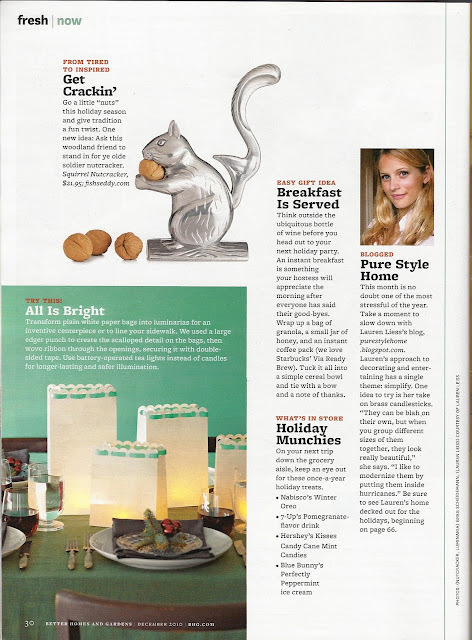 I was very happy to find out that the Better Homes and Gardens magazine that you are in was one of them. The article is great and I loved seeing the photos. 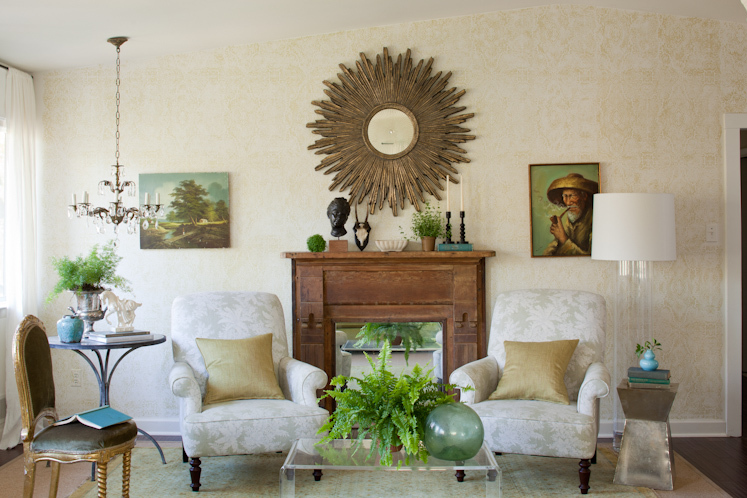 This really was one of my favorites this year in Better Homes & Gardens and I had already seen snippets of your space before it was published..what I am trying to say is this is a great space that is hard to get sick of. I just love seeing all of this goodness happen to such a lovely, genuinely wonderful and talented person! I snatched up a copy as soon as I could and loved loved loved the article. Can't wait to watch your business (and family!) evolve. You're such a deserving person and designer. Happy New Year, friend! Thanks for showing it in full Lauren. I cant seem to get it here and it would be about Feburary before it came anyway. Your house is stunning and it really is a credit to you. You look beautiful too as always. Congrats and way to go!! Love your blog! PS I don't know if you have ever mentioned where you got your super cool sunburst mirror? It's probably an antique but I am in LOVE with it!! I didn't get a copy of the BHG so I'm thrilled I'm getting to see your article and the pictures. Thank you for sharing...your home is so wonderful and inspiring. I subscribe to Better Homes and Gardens and I can't tell you how many times I have gone back to that issue to look at your house! Just beautiful! Best wishes for a happy and healthy new year! it WAS a beautiful piece! 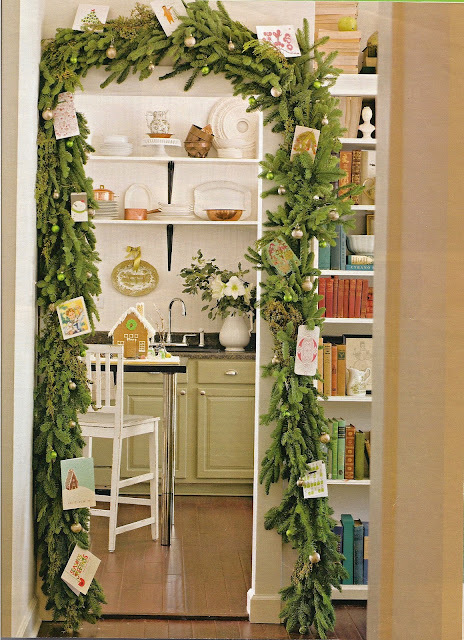 I did manage to *try* to copy your card garland. You can sigh a big relief...cause I didn't even come close! Glad you had a Merry merry! Love it Lauren!! Congrats again on the great shoot. Love the changes you have made too and those big glass floor lamps. Happy New Year. SO glad you posted it!! What a fantastic shoot.... I bet you got a zillion new ideas from having them in your home. Stop being silly and apologizing!! This is a fabulous accomplishment lady! More to come I'm sure as your talent is quite endless it seems. Happy New Year! This article really captures the warmth of your home. It's just so gorgeous and happy! Every image made me smile. I couldn't be happier for you, Lauren. No one deserves this more than you do. I know there are great things in store for you and your family in 2011. I can't wait to share each event with you here at Pure Style! Wishing you and your family a Healthy, Happy, and Prosperous New Year!!! I love the lantern in your entry. Any info on it? I just bought a 5 year old house and every light fixture is brushed nickel with traditional styling--not my fave. I happen to ADORE and covet your lucite coffee table I hope you kept it. I am trying to talk my family, at least the 13 yr. old girl and husband into one of our own. Something I didn't notice the first time I browsed through your spread was the apple green theme - even in your family's clothing, the chalk on the fridge and the snowman's scarf! Definitely one of my favorite colors and fun to see how it repeats in all the photos. Was that your idea or BHG's? Such a great article! I have really been enjoying BH magazine lately! I would love to know where you found you green couch? If you've already answered this I'm sorry...I just found you and added you to my fav blogs! Congratulations Lauren! It is a beautiful piece!! I wish oyu much happiness and success this year. On a chilly morning in early December when my son gave me my very first copy of BHG I had no clue what a treat it was going to be. Your home is so beautiful because each item and aspect of your home represents something about you/your family or is something you really love and so it looks like a lovingly created real home. In BHG I found out about your blog and now I have to check it every day and sometimes several times a day. It is so inspiring to me. I love the post about Truth in Design and that idea is guiding me in decorating my home now. I also loved the post on Weeping Willows. It is beautiful. I hope you have a great new year and I am looking forward to reading more about your work in your blog. Thanks for all that you do! My name is Anna and I had earlier left a comment for you. However, probably due to the fact that I am brand new to the process of leaving comments on blogs I pressed the publish your comment button twice and so my comment came twice. In a panic I deleted one of them and that explains the blank space in your list of comments. I am very sorry for this. For me who has been praying to Christ for healing from depression for the past 21/2 years, introducing me to your blog and through this blog other blogs of people committed to decorating and making their environments beautiful expressions of themselves was the way in which Jesus answered my prayer. The introduction to this blog is my best Christmas gift from Jesus. I love reading about how you make your home beautiful, the other projects you do, and the pictures which help explain everything. Thanks, thanks and thanks. May God bless you and may all your dreams come true! i bet you are so proud! to see your home on a glossy print page must be so surreal. way to go! your blog is beautiful, and so is your home and family. Lauren- Like Maria, I have a copy of the issue out for all to see. It's such a lovely story and I really enjoy hearing all the little details you have added to the beautiful pictures. It was so exciting seeing your home in print! so excited for you. Congrats!!! Great pictoral...gotta get a copy! And no, I'm not tired of seeing it again...especially the green English couch...your brilliant stairwell, and the evolving style of your home. Where did you get the hanging chandelier in the entry by all the frames? So cool! A bit slow here in getting up to speed on my favorite blogs...and even though I get BH&G, I didn't get this issue. So, thank you for posting all the pics. Amazing, amazing, amazing! This should be the highlight of your year.....what a thrill to have your vision and hard work recognized and photographed so beautifully! Congratulations also on the furniture line - I'll keep an eye out for its debut!